Lion Dairy and Drinks has launched a new marketing campaign encouraging Australians to drink milk again. According to Lion, nine out of 10 Australians are not consuming enough dairy. Three in five say they are confused over the conflicting information surrounding milk and dairy. 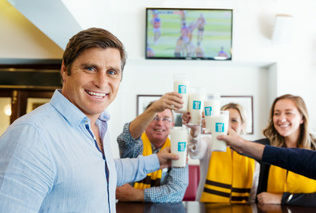 To address the problem, Lion has launched their “Milk Loves You Back” campaign with ex-AFL player Shane Crawford as an ambassador. “As an athlete, milk has been an important part of my diet, from back in the day when I chose milk at the pub which earned me more time on the field,” Crawford said launching the campaign. A ‘Milk Loves You Back logo will now appear on Lion dairy products, along with nutritional information boasting the benefits of consuming dairy. Lion Dairy and Drinks brands include Dairy Farmers, Pura and Masters milk. The campaign is not the first time Lion has focused on marketing the nutritional facts of its products. In August 2015, the company decided to display nutrition panels on its alcoholic beverages even though this is not a requirement under Australian law. In December 2015, Lion launched ‘Beer the Beautiful Truth’, a marketing campaign designed to shed light on the nutritional truths of its beers. Is low-fatmilk really better for you?